Unifor Local 103 representing 350 unionized employees at the ONTC is urging its members and the general public to support the NDP candidate in the riding where they live, in the upcoming Ontario Election Thursday. “The Liberal party put Ontario Northland workers and the communities we serve through two years of gut wrenching chaos with their plan to conduct a fire sale of ONTC assets," , said Unifor Local 103 President Brian Kelly in a news release. "After much lobbying and support from the communities, customers and employees the Liberals have decided to keep the ONTC with no plan for future work but still intend to sell off ONTERA to Bell Aliant. A vote for the Liberals is a vote to continue the chaos,”Kelly said. “Mr. 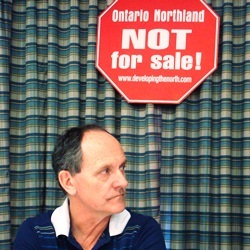 Fedeli and his party are no friends of the ONTC and do not deserve our support”, continued Kelly.